He might try to give us a fierce face but our little Norse exudes bundles of cute in his handmade Viking costume. Earlier we shared the first part of our DIY Viking costume tutorial. Pop back to that post for details on how to make the felt battle axe and shield. 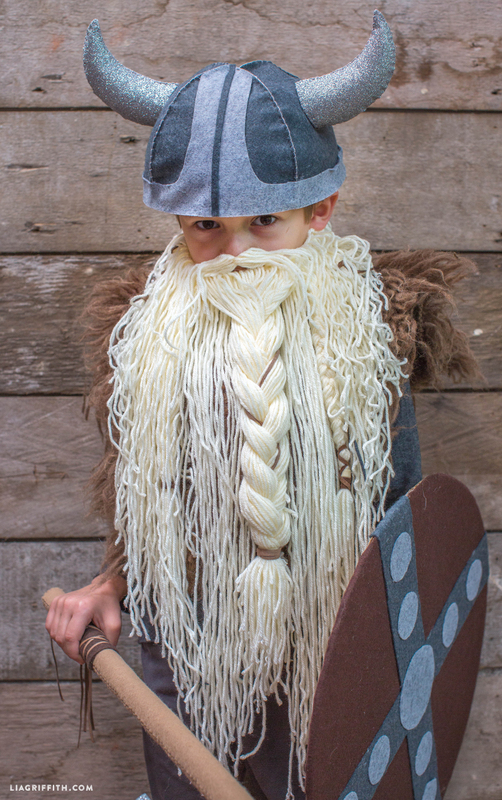 To complete this costume, here the patterns and tutorials for that incredible yarn beard and the Viking helmet with horns. We designed both with simplicity in mind, but wanted each of the pieces to offer maximum wow. The trick with the beard is to use lots and lots of yarn – we used a whole ball and we think the beard looks great for it! Thread the braids with leather thong or tie around a braid or two at the bottom for added interest and detail. 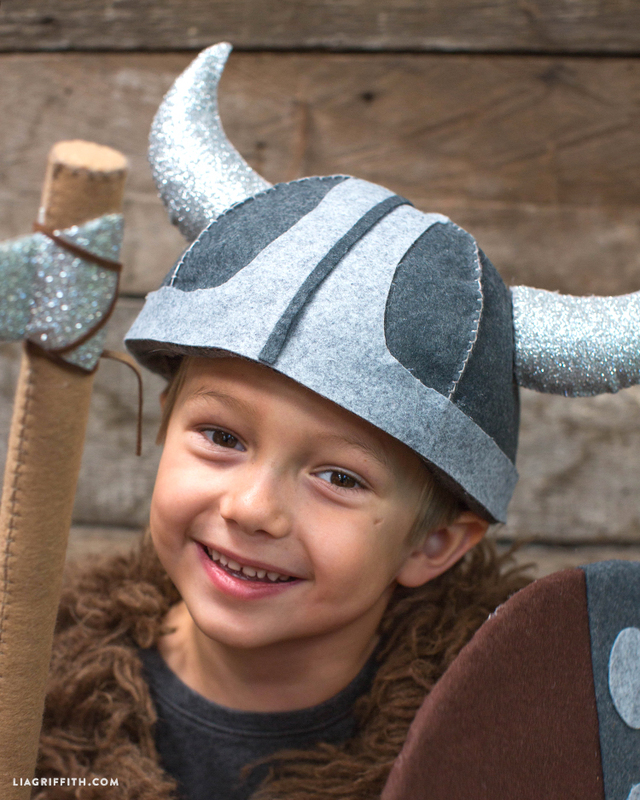 The Viking helmet is soft and easy to year since it is made of felt with added details of glitter horns. Once you have used a blanket stitch for the main pieces and stuffed them with filler, a low temperature glue gun will be your best friend for adding the stripe details to this project – it makes putting these pieces together really quick and simple. Go forth and conquer, my Viking loving friends! It’s not clear to me how the mustache and beard and connected. Maybe just attached with hot glue? Could you give me a clear idea of the best way to put these two pieces together? Thank you very much! If you will allow me to use your idea of sewing the helmet of a Viking. Sometime it really depends on the size of the person that will be wearing it but you can look at the pattern to determine the quantities needed. With Felt most sellers sell either by sheet or yardage and since all the sheet sizes vary so much it just seem to confuse people more if we list a sheet size and then they cannot find it.